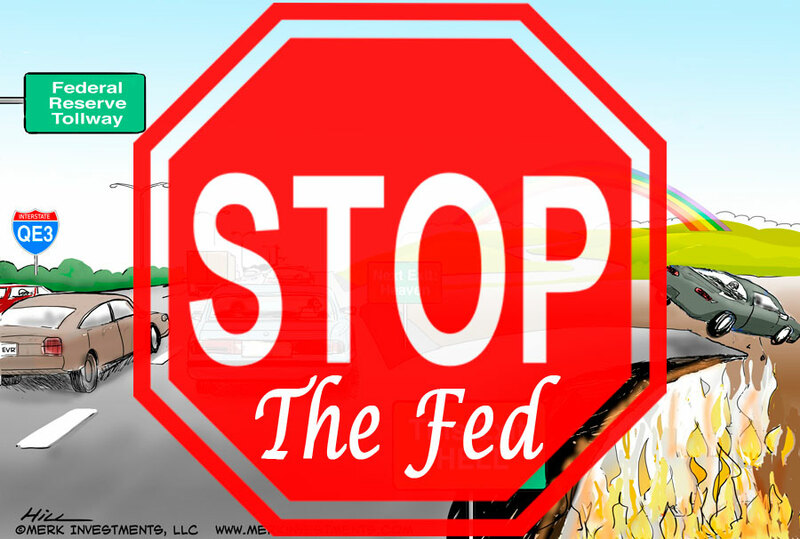 Merk Insights - Stop the Fed?! Central banks have been ever more engaged in the markets. More than seven years after the onset of the financial crisis, we are still arguing whether we can afford interest rates above 0%. Asset prices have been inflated, benefiting those with assets, but doing little for the working man and woman. Governments from the U.S. to Europe and Japan appear to ever more rely on central banks to provide them with cheap money to keep their deficits sustainable (at zero percent interest, at least in theory, any deficit appears sustainable!). Generally, when asset prices are distorted, we are all but certain to get capital misallocation. This isn’t simply bad for investment managers that chase the Fed rather than invest on fundamentals- it can also be bad for real investments, as it is difficult to discern what real projects are worth investing in. The easy money can also be bad for the social fabric of nations. Without rambling too much about the socio-economic implications of extraordinarily low interest rates, in our assessment, the rise of the Occupy Wall Street movement; the rise of the Tea Party; the success of Abenomics; as well the success of various populist parties in Europe are all a byproduct of monetary policy that’s gone astray. Central banks may not be solely responsible for all the ills of the world, but they have played and continue to play a catalyst. Many may be thankful for the Fed to have “saved the day” in 2008, but the Band Aid approach imposes a heavy toll. The Fed’s role has expanded vastly over time; be that by adding a full employment mandate in the 1970s; be that by adding responsibilities for consumer protection; or a mandate for overall financial stability. What about going back to basics. In reverse order of the below list outlines how radical one might want to be. Let me say that by describing them I am not necessarily endorsing any of these initiatives. Let’s be honest about money and have the government, not the Fed print money. From today’s perspective, this may sound extreme, but it’s not impossible. To have such a move be viable, one should address one of the main reasons why we used to have many panics and bank runs until the introduction of the Fed: fractional reserve banking. Modern finance is based on fractional reserve banking, but it does not need to be. For those interested in learning more about ‘full-reserve banking,’ the Wikipedia entry on the topic is a good starting point. Some love it; others hate it. The gold standard takes away the power from policy makers to print money. And that’s the reason why it hasn’t survived. Even if we went back to a gold (or other metallic) standard, odds are that, sooner or later, politicians would once again find ways around it. As such, anyone interested in the gold standard should consider building their personal gold standard, rather than rely on a government to take care of it for them. The Fed should be allowed to hold nothing but Treasuries. If the Fed were to get stuck with something other than Treasuries, for example, when collateral needs to be seized upon the failure of an institution to which collateral was provided, such collateral should be swapped for Treasuries with the Treasury. Any political decisions on how to administer them would then be shifted to a political body. If one resigns to the likely fact that the Fed is going to be around, let’s have them try to be good at least at one thing: inflation. Let them not try to hide behind 1001 excuses why they can’t raise interest rates. If the mandate were clear, it would be easier to communicate, easier to implement. Oh, and should one mention that low inflation when oil prices fall isn’t necessarily bad (Sweden’s central bank has of late been heavily leaning on that excuse to keep rates low). A sole focus on price stability isn’t perfect, but should go a long way towards allowing price discovery to take place with fewer distortions, if combined with a ban for the Fed to make fiscal decisions. No, this isn’t the #AuditTheFed movement, but this would be a Taylor-type of rule as a benchmark. The Fed wouldn’t be required to set policy according to the benchmark, but would need to elaborate on deviations from it. This may sound boring, but, in our opinion, would be huge progress versus the tea leaf readings that take place now where policy makers appear to be running in circles, looking for clues from the market as to what they may do next. All of these ideas have one thing in common: simplify monetary policy, realize its limitations. If central banks don’t reverse course, it’s more than money that is at stake. The Great Depression ended in World War II- we don't think that’s a coincidence. When central banks help to prop up systems that are unsustainable populist leaders come to power. Because if there’s one thing that hasn’t changed in history it is that policy makers rarely ever blame themselves for the challenges they are facing. To continue this discussion, please register to join us for an upcoming webinar. If you haven’t already done so, ensure you don’t miss it by signing up to receive Merk Insights. If you believe this analysis might be of value to your friends, please share it with them.